Species-rich grasslands in Europe are biodiversity hotspots, providing multiple ecosystem functions and services. We are experiencing a global loss of species, and one of the main drivers is habitat loss associated with land use change. Species-rich grasslands are particularly endangered, both by conversion to crops but also by land abandonment. Landowners and farmers increasingly lack incentives to continue extensively managing (grazing or mowing) such habitats, particularly when the true value of such species-rich grasslands is not common knowledge (habitat for many animal species including pollinators, carbon storage, erosion control, biodiversity source etc.). An economical use of hay from meadows depends on good quality hay yields. Thus, improving hay yield whilst maintaining species richness of plants may provide better incentives for farmers to continue managing or even to ecological restore sites to species-rich meadows. Recent biodiversity research has shown that grasslands with more species as well as a wider range of functional traits function betters than those that are less diverse. In particular, sowing more diverse seed mixtures leads to more productive hay without losing species richness of the meadow communities. The research group of Prof. Vicky Temperton in the Sustainability Faculty of Leuphana University Lüneburg, Germany, has been combining biodiversity and assembly research with a view to informing ecological restoration and conservation of grasslands. 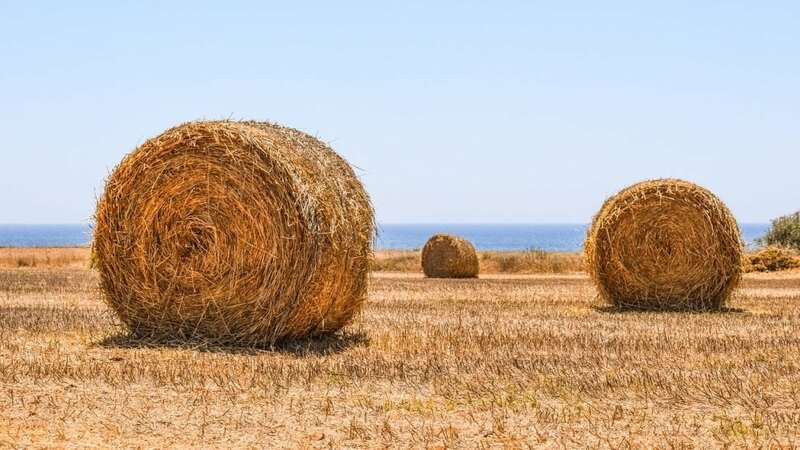 The goal is to boost hay yield by sowing high vs. low diversity grassland mixtures as well as manipulate the order of arrival of different plant functional groups, in order to create so-called priority effects. Priority effects occur when species that arrive first at a site after disturbance (clearance) significantly affect the further trajectory /development of the plant community over long periods of time, thus affecting ecosystem functions and services. The field experiment site, located just outside the Forschungszentrum Jülich, taken by a drone controlled by Andreas Burkart. A field experiment at the Forschungszentrum Jülich from 2012-2015 explicitly combined knowledge from biodiversity and assembly research to test its potential use in the ecological restoration of species-rich grasslands. Sowing grasses, legumes (nitrogen-fixing species such as clover) or forbs (non-grasses) a number of weeks before the other two plant functional groups created priority effects on community productivity caused by the different order of arrival. In particular, sowing the legumes before the rest created the highest hay yield, but this effect was intermittent and not long- lasting (Weidlich et al. 2017 Frontiers in Plant Science). Belowground, however, sowing legumes first reduced root productivity creating a priority effects that become stronger over time (Weidlich et al. 2017 Journal of Ecology). This suggests that effects of order of arrival are not synchronous above and belowground and this potentially useful phenomenon now needs further research. No biodiversity effects of sowing high vs. low species mixtures were found in this experiment, but this may have been due to the particular choice of species. A potentially interesting alternative use of hay from species-rich grasslands is plant biomass as a bioenergy source of methane gas. 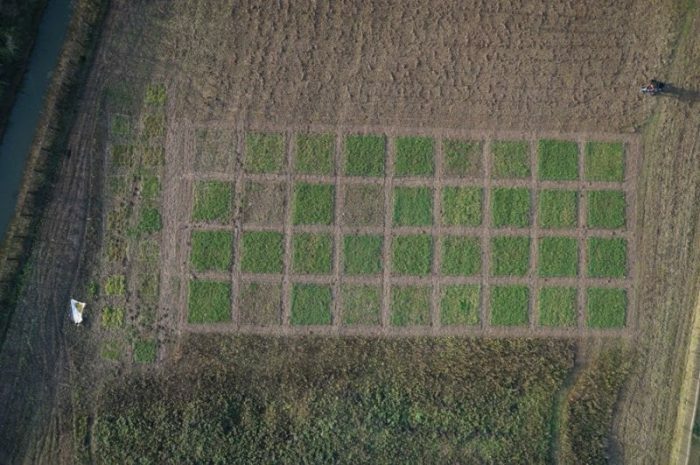 The methane potential of the hay in the priority experiment was tested in response to different order of arrival treatments in collaboration with Drs. Denny Popp and Heike Sträube from the Umweltforschungszentrum Leipzig (UFZ). The order of arrival changed the species composition of the hay and this stimulated the methane yield particularly when grasses were sown first (Popp et al. GCB Bioenergy 2017). Overall this research highlights that manipulating the order of arrival of different plant functional groups can significantly affect species composition and hence methane yield as well as lead to larger or smaller storage of carbon below ground. A restoration aiming at increasing hay yield whilst maintaining species richness might, therefore, use a different order of arrival (sowing legumes first) than one aiming at increasing methane potential or belowground storage (sowing grasses first). Future experiments will test how contingent such outcomes are on specific weather conditions during early seedling establishment. This research underlines the potential of steering grassland communities that are newly established (such as during restoration) towards the desired ecosystem functioning outcome, be it improved hay yield, methane potential, biodiversity or carbon storage. These findings are described in the article entitled Methane yield of biomass from extensive grassland is affected by compositional changes induced by order of arrival, published in the journal GCB Bioenergy. This work was co-led by Vicky Temperton from Leuphana University.